Beans are sensitive to broadleaved weeds such as red root pigweed and lambsquarter. Beans growing in a "killed" fall rye mulch. 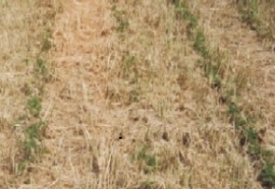 Fall rye used as a cover crop has been shown to be capable of providing significant benefits in reducing the need for in-crop herbicide weed control. 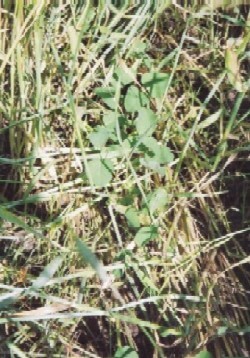 The cover crop has been used in regions of the NE USA to suppress weeds in special crop and vegetable production. Recent work in western Canada (Moyer) has determined that under favourable weather conditions, fall rye was as effective as post-harvest plus early spring tillage or herbicides in spring weed control. This is especially important under a no-till system, where the cover crop is killed in the spring at the time of seeding either mechanically or with the use of herbicides and left on the soil as a surface mulch. Under this system, the soil is protected from the damaging forces of raindrop impact and wind during the long period between fall harvest and the late-spring seeding of the bean crop. Where beans tend to be grown in rotation with other low-water use crops such as potatoes, the use of a cover crop can aid in dewatering the subsoil in order to abate the effects of salinity. Beyond this, this killed mulch contributes to the organic matter levels of the soil, causing an increase in aggregate stability, and leading to increased water infiltration rates and water holding capacity to help the bean crop make it through some of the drier parts of the season. 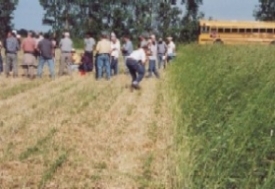 The site set in up Carman, Manitoba tested four different methods of bean production in blocks containing either a fall rye cover crop or simply left as a bare soil surface. The rye crop was seeded in mid-September at 1.5 bu/ac. By the time the cover crop was killed (glyphosate application of 1.5 L/ac on May 31), its dry weight had risen to a healthy stand of 3.066 MT/ha. The beans were seeded into the trial on June 3 using a no-till double-disk drill at a rate of 85 lb/ac. At this time the treatments were divided into high fertility rate (160 lb/ac ammonium nitrate + 34 lb/ac MAP) and low fertility rate (53 lb/ac ammonium nitrate + 34 lb/ac MAP). All of the AN was deep banded with the seeder moments prior to the seeding of the beans, while the MAP was placed in the soil with the seed. Half of the treatments received a herbicide application on June 28 of 0.91 L/ac of Basagran. This provided adequate weed control for all of the herbicide treatments throughout the growing season. The trial was then harvested on September 24. The beans in the trial were seeded June 3, followed by heavy rains that inundated the region. These rains caused soil crusting in the non-mulch plots. Because of this, bean density was higher in the mulch plots. The differences in crop density between mulch and non-mulch treatments may also be attributed to the increased water content of the top layer of soil in plots containing a fall rye mulch. By June 17, the 0-2cm layer of soil in the mulch plots had a 51% higher water content than the control treatments, contributing to a higher survival of germinating seedlings. This topsoil moisture advantage in the mulch plots was maintained at an average of 23.37% more water than the control plots between the dates of June 4 and July 11 (the date at which these measurements were terminated). The presence of a fall rye mulch layer seems to increase the efficiency by which the bean crop uses available water resources. Beans gowing in mulch used 41.78mm less water than beans in the non-mulch plots. The control treatment seriously lacks any major ground cover and is therefore subject to greater rates of sunlight exposure and air movement, causing additional moisture to be drawn from the soil. The higher evaporative rates would also suggest an increase in upward movement of water through the soil due to capillary rise, leading to a higher risk of salinity, a problem that can be suppressed with the use of cover crops. At the end of the day, the most important outcome of this experiment may be the yield advantage created by the effect of the fall rye cover crop (Figure below). In the conventional high fertility/+herbicide treated plots, the presence of the fall rye mulch contributed to a modest yield increase of 8.67%. The gains seen in this system are likely a result of higher plant counts. Under the low fertility/+herbicide treatments, a modest 7.58% yield loss was noted. In this case, beans in the fall rye treatments had a slightly off colour when compared to the control treatments, leading to the reasonable assumption that there was too great a gap in nitrate availability in the soil between the two treatments for the cover crop factors to compensate. The systems which showed the greatest differences in yield between treatments include those where the beans were produced in the absence of pesticides. The system with high fertility/-herbicide saw a 42.44% yield increase from the presence of the cover crop, while the low fertility/-herbicide treatment saw an even greater gain (50.41%). Though the crop yield in these systems was dramatically reduced compared to production using pesticides, this data suggests that there is room to at least reduce the use of pesticides during the production year when the beans are grown in conjunction with a fall rye cover crop. The site selected for this trial was heavily infested with redroot pigweed, however, the cover crop appears to delay the emergence of these weeds, as well as reducing the overall population of weedy plants. In the case of no herbicide use, the lower fertility treatment seems to be favoured for higher yields, due to the higher fertility rates causing weed growth to be more vigourous, thus reducing light availability for the bean plants. Effect of fall rye cover crop on bean yield in four different production systems. Beans growing in rye just prior to rye termination. Seed fall rye in September. Seed soybeans into living rye crop in late May (rye is about 3 feet tall). After rye has flowered, use flail mower to mow rye. Mowing height should be just above the soybeans, which are about 8 inches tall at this stage. Do not use a batwing or rotary mower as it tends to windrow the mulch. The killed fall rye mulch provides an excellent weed suppressing mulch. Limitations to this system include need for moisture to support rye and bean crops and limited options for in-crop tillage due to heavy mulch cover. Field trials using this system are being conducted at Libau, MB in 2004. Left: fall rye mulched; right: fall rye left uncut. 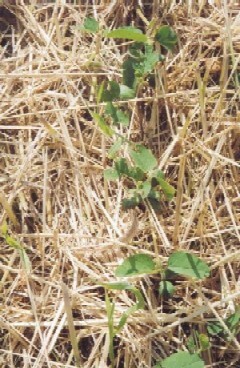 Organic no-till soybeans growing in fall rye mulch. Fall rye mulch can improve pulse yields in organic or low-input production systems. Ensure that moisture is not limiting before attempting. Key to success is healthy fall rye stand.